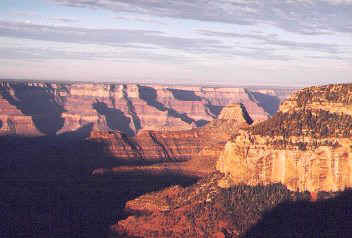 This Photograph was taken at sunrise at Bright Angel Point on the North rim of the Grand Canyon. It takes about an hour to hike here (in the dark) but the reward was worth it. 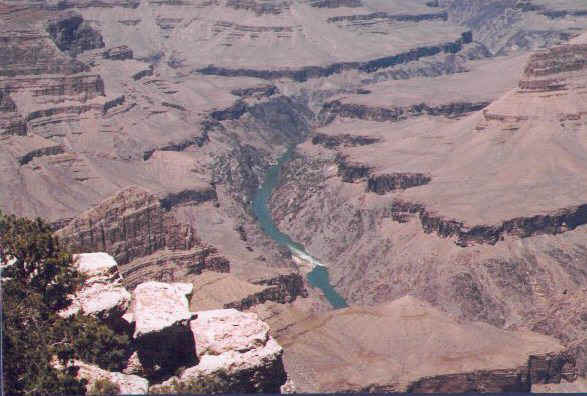 The view is stunning as night time's dark fingers slowly let the canyon slide into another day. These scans really don't do these photo's justice, colors are deep and vivid and the images are crystal clear. Summertime can be very crowded here, But if you would like to enjoy the canyons beauty with smaller crowds then I recommend the North Rim. Only drawing about one tenth of the visitors that the South Rim gets, the North Rim has a beauty of its own. 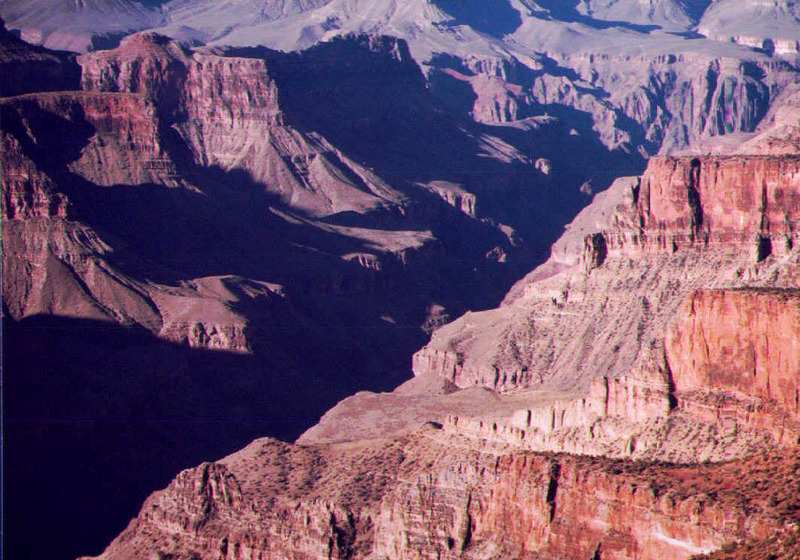 You will still be treated to magnificent views of the Canyon, but in a less spoiled atmosphere. 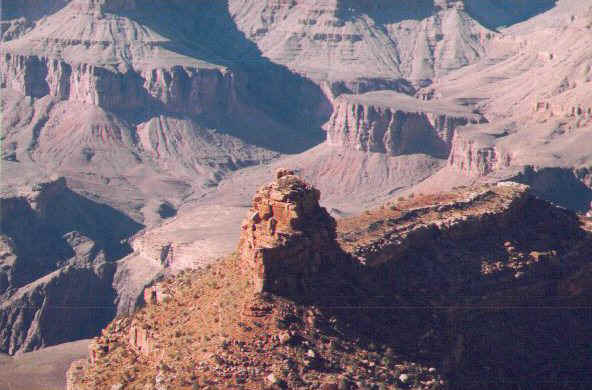 Because the elevation here ranges between 7000 and 9000 feet the North Rim receives about 150 inches of snow annually limiting visitor activities to a late spring through autumn season. The one road leading into the park is closed the rest of the year. The drive to the North Rim is wonderful, if your are coming from the north you pass through beautiful meadows and forests of pine. 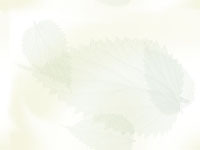 Take a deep breath of the of this cool pine scented air! Soon you will come across the entrance to the park and just after that the campground. There is a lodge here, as well as cabins to rent. I prefer to stay in the campground in our RV. Although the campground is primitive (no hookups) it is beautiful! the lodgepole pine trees tower over us and just sitting in a lawn chair watching their swaying movements is almost Hypnotic. 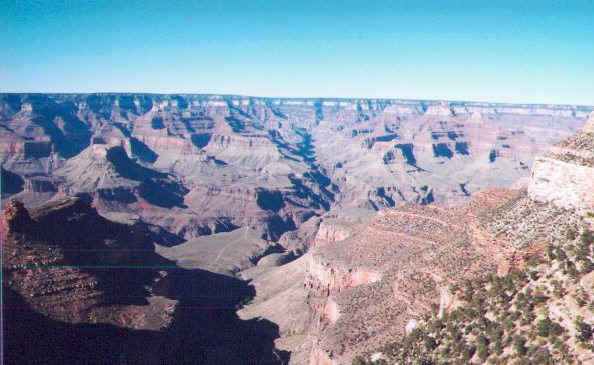 Perhaps the best view is from Bright Angel Point. The trail starts near the lodge and is only about a mile long. There are some rolling hills on this trail, but if you get winded then simply stop and enjoy the view! I went out to the point twice, once at sunrise and I have to tell you the Images from that morning, even if I had no camera, are something I will never forget! I felt as if I was part of time, standing there in near silence as the dark shadows slowly slid across the canyon. 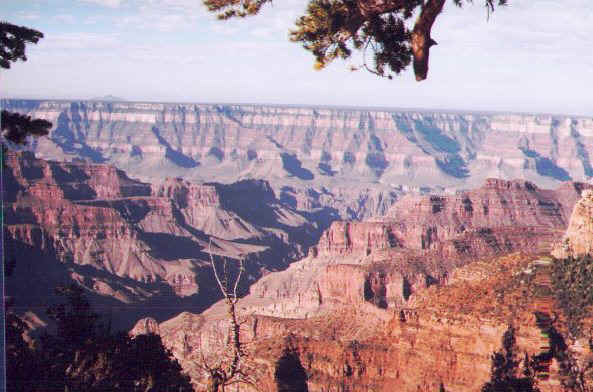 You could spend your entire vacation at the North Rim, two or three days will cover most of the high points. Now if you are ready to try the South Rim lets go. 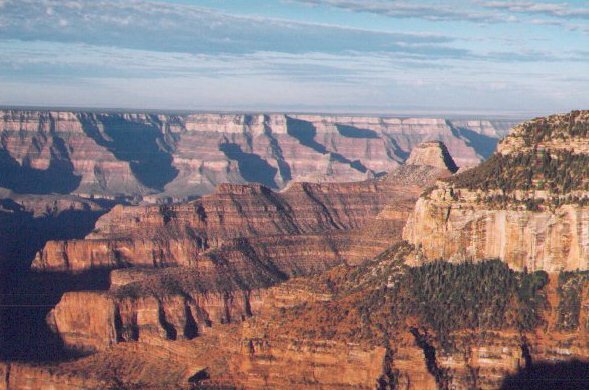 It is only about 11 miles as the crow flies to get to the South Rim visitor center(you can actually see the lights at night from the North Rim) but its 214 tough miles driving to get there! The drive starts off easy enough, all down hill, The temperature starts out a cool 60 degrees and as you descend, quickly rises. Soon you lose the trees and the landscape turns from a mountain forest to desert. By the time you reach the floor of this valley the temperatures are near 100 and its not even 10 in the morning. It really makes you wonder how people survived trips like these in the old days. After several hours of driving you start back up the other side, it seems as though you will never get to the top. Eventually you get to the entrance gate and you can relax. As you drive into the park there are many pull-offs along the road each with a different view. You probably will never forget the first time you look into this canyon! There are several places to stay in the park including some world class Hotels. There are two main campgrounds, one for RV's and a primitive one that is much larger. We stay in the primitive one. When I made the reservations for the campground months in advance over the internet they made no mention that there is an RV park. There is so much to see and do here. That's probably why its so crowded, there are lots of restaurants and shops and even a small museum with some historical photographs. From the central village area you can park your car and ride the bus system. Its quite convenient and clean it sure beats looking for parking places. In the summer the only way to get to the west rim is on these buses, but you can get off and stay at any stop as long as you like. The west rim trail is a fantastic hike, but ride the bus out to hermits rest and then start your hike heading east. The trail is mostly down hill if you go east! Make sure to catch some of the ranger programs, as well as the Hopi dancers both are informative as well as entertaining.